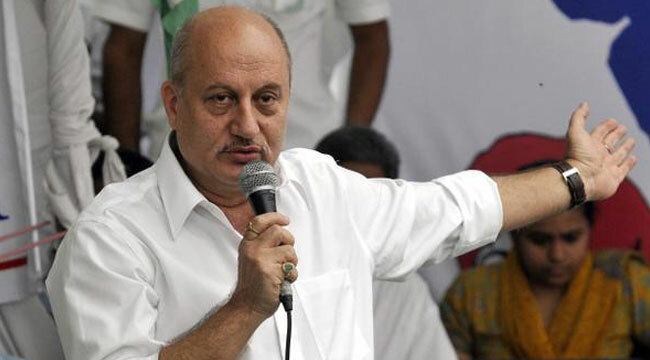 In an exclusive interaction with Aditya Raj Kaul, Actor anupam Kher says he might contest elections in future if That is important for a political change. You were at Jantar Mantar supporting the movement against corruption led by Anna Hazare, which will soon enter the political fray. Where do you see it heading now after this major step? The process is inching towards a possible corruption free India; it’s a step towards possible honest politicians who will give good governance. Indians should feel proud of their country and its achievements, not only in dreams but also in morality. We Indians do not feel proud of ourselves and our nation unless we are at war with Pakistan or playing cricket matches against them. It will change, hopefully. Don’t you think the massive support for Team Anna across India since the crusade began in April 2011 was because of its apolitical nature? The response can be described in three different categories. A pessimist would have said 'Nahi, aisa thoda hota hai ' (This is not how things work). A cynic would have said 'Oh yeh politics toh hota hi corrupt logon ke liye hai' (Politics if the culmination of all corrupt people). Being an optimist, I feel 'Kuch na kuch hoga' (Something or the other is bound to happen). When I came to Bombay the only thing I had was hope. And I see myself as an end result of that hope. Success is always because of your attitude towards life, not talent alone. Crowd is never a measure of success. It is much deeper than that. It is not an India-Pakistan match or an IPL final. People who have been cynical about it should keep quiet now. Two of Team Anna's major supporters, spiritual leader Sri Sri Ravi Shankar and activist Medha Patkar distanced themselves from the move. Is there no consensus? There are always different opinions. I am not saying that what Ravi Shankarji or Medha Patkar is saying is wrong. When we were fighting for independence, different people fought in different ways. There was Gandhiji’s ahimsa, Netaji Subash Chandra Bose and the Azad Hind Fauj and also somebody like Bhagat Singh who went in the Assembly and created quite a situation. The goal of all these people was to get India freedom. The same goes for todays' movement. As you have been supporting Team Anna since the very beginning in its campaign, would you yourself volunteer and contest elections? I do not have any political aspirations. I am happy doing what I have been doing. If I am required to in any kind of a situation, I will raise my voice. As an individual, I am happy with that. If after seven or eight years I realise that it (contesting elections) is important for a political change, I might do it. But, I do not see it happening immediately. Congress General Secretary Digvijay Singh has often alleged that this movement is being funded by the RSS. How would you react? Well, it has become a joke now. If someone’s tyre gets punctured on the highway, he’ll say ismein RSS ka haath hai. I don’t think we should dignify the statement by answering it. Strangely, while Anna Hazare supports Team Anna giving a political alternative, he distances himself from it. Why? May be it is Gandhiji’s inspiration. He toonever took a government position. Maybe, Anna Hazare is walking on the footsteps of Gandhiji and that should not be held against him.